FSU Art Professor Holly Hanessian will begin a new tenure as President-elect of the National Council on Education and the Ceramic Arts (NCECA). She will serve as the council’s President for four years. NCECA was founded as a non-profit organization in 1966 after several years of affiliation with the Ceramics Education Council of the American Ceramic Society. 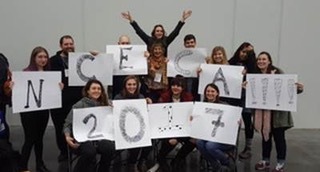 NCECA’s founding charter was developed by ceramic artists who saw the benefits of a professional organization in its ability to create identity, definition and support for the ceramics teacher and artist, and to promote advancement of the ceramic arts. It is a dynamic organization that fosters global education and appreciation for the ceramic arts through programs, exhibitions, publications, opportunities and resources inspire advancement of the field. It is a member-driven organization, with an annual conference of 4,000-6,000 attendees made up of artists, students, individual and corporate patrons, as well as gallery owners.